I feel like I'm missing something really obvious here, and it is driving me crazy. I can't get this working at all. I applied the changes mentioned in this post https://gamefaqs.gamespot.com/boards/522595-final-fantasy/45575058/499636109 (and the PRNG patch which I was told was needed), and then proceeded to update the tables. an is a normal DTE character, and I had added di to one of the new slots. Neither of them show up in game now (it's supposed to read Bandido), and most stuff is just junky looking. Does anyone know what it is that I am doing wrong? Off the top of my head, this could be due to the original game's code for displaying monster names not handling DTE codes the way you would want it to. Assuming that is the correct diagnosis, you might be interested in using Lenophis' Battle DTE fixer upper patch to treat the symptoms . 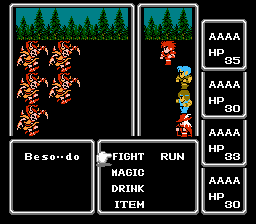 Out of the box, the US version of FF1 does not use DTE when in battles, so using DTE characters won't work. The hack on the gamefaqs link does not address this, it merely increases the number of DTE entries you can have. I don't see any reason why the linked patch wouldn't fix the issue. I already have that patch and have found it super useful. I found myself needing more combinations though, which is why I sought the expansion, but unfortunately as I have shown I can't seem to get it to work. I know it must be something simple I'm overlooking, but I have done it over and over and can't seem to get it to work. Can you post your ROM? I might be able to take a look at it today. Thanks, here are three patches. The one with the table+prng doesn't work either, but I put the separate patches too along with the combined one. The combined IPS has the new text edit patch, PRNG+Table+DTE Battle, extended strings patch with some menu edits from Grond. I didn;t include the graphical stuff since it's unimportant for this issue. And Lenophis' hack is changing the battle text routine, but is unaware of the changes to the DTE table that Grond made. The first byte tells it the DTE table starts sooner, and the second byte tells it it ends later. PS: Sorry for the late reply. Had to run some errands after work so I couldn't get to this as soon as I would have liked. That did the trick 100%! Went from 3 KAB for enemy names to now 66! I shouldn't be running into any problems now for my remaining monsters. You're awesome, thanks for the help. It was driving me insane, haha. I couldn't figure out what was wrong with it. So Lenophis' hack needs some tweaks. How dare my hack not be self-aware! Clearly I need to address this. Haha. I didn't mean to dog your hack. It's great. I just meant it needs tweaks to be compatible with Grond's hack. Nah, you didn't. I just like to poke fun at stuff I do.